Like my split screen effect? Yes, at long last all the quilts from the March/April Covered in Love block drive are done and delivered! 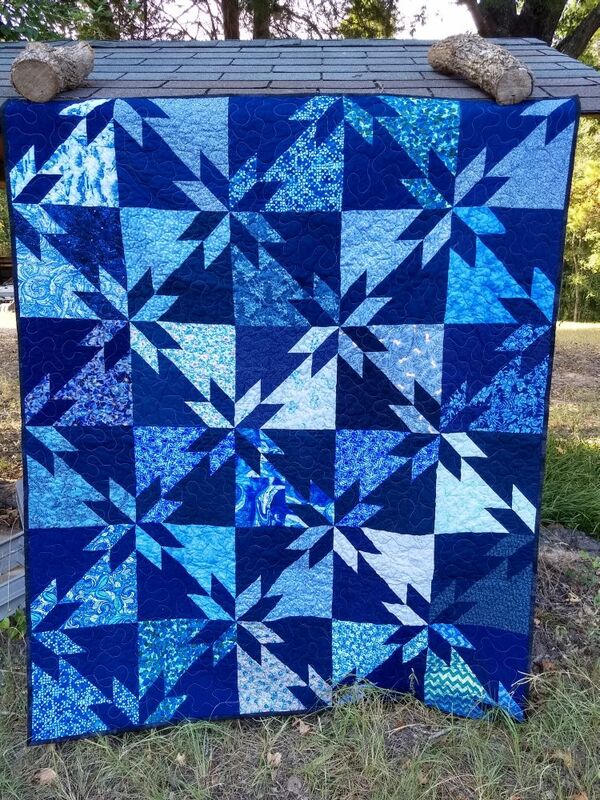 There were thirteen of these "regular" blue Hunter's Star quilts made from 390 blocks sent in by over 60 quilters. I also count the RWB Hunter's Star UFO blocks sent in by Pam during this drive and there will eventually be one more quilt made from leftover blocks, so 15 total! 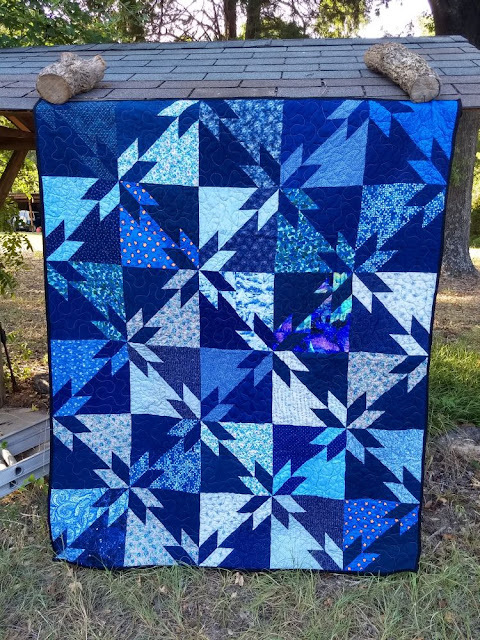 Even though this was a really simple block I love the quilts made from this drive. 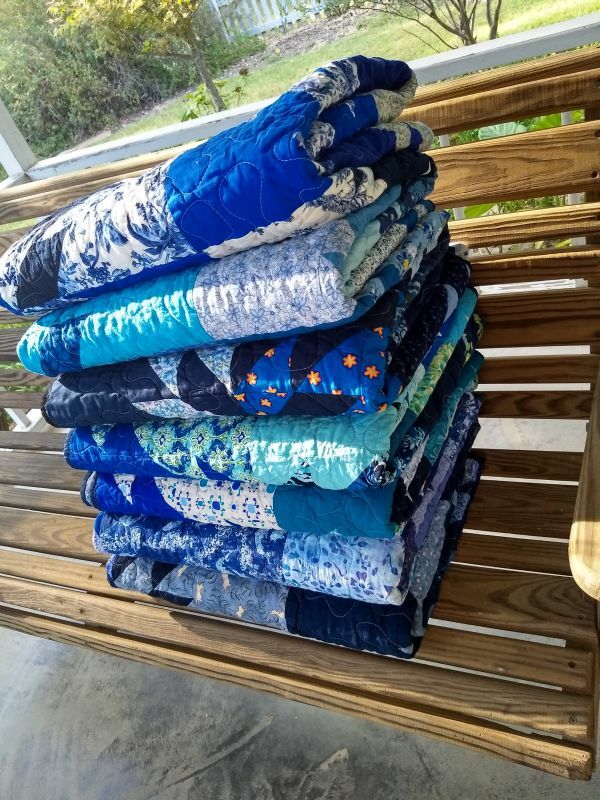 Covered in Love gives quilts to the families of patients who pass away in the hospital as a comfort item. 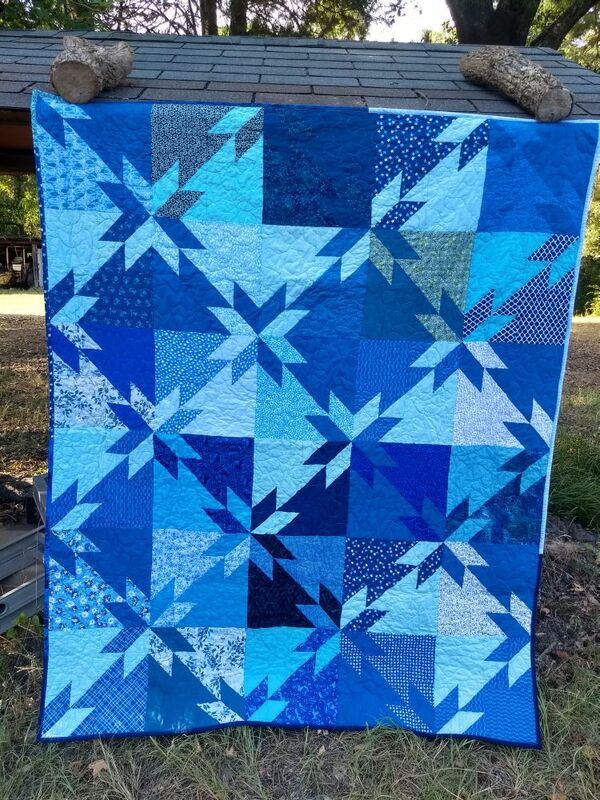 We are always in need of more men's quilts, so these blue ones are especially nice. Gail C., besides sending in two tops, a stack of loose blocks, and some backings also gave me a bag of prepped bindings that I used to finish these. 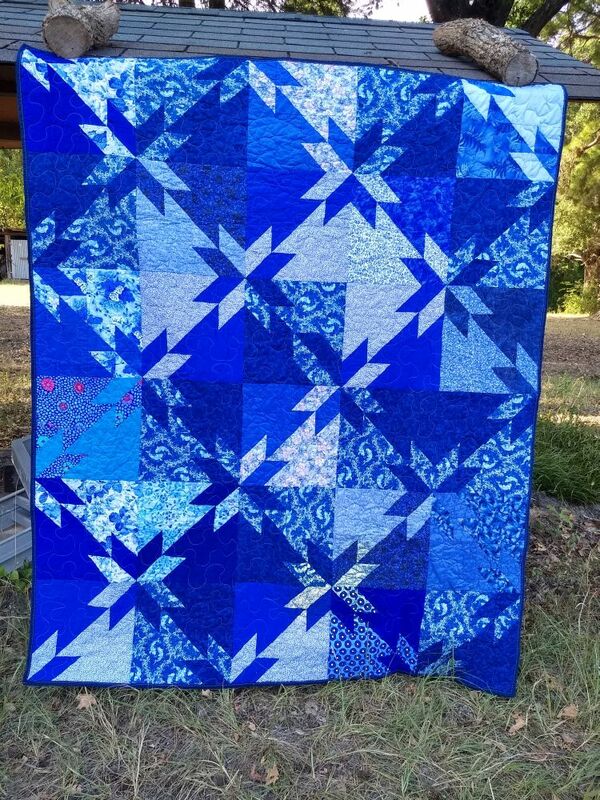 I grouped some of the blocks together deliberately; this quilt has blocks with blue-on-white prints. Those of you who have sent in backings, I really appreciate it. I have such beautiful blue, grey, and brown "manly" backings to compliment these quilts perfectly. 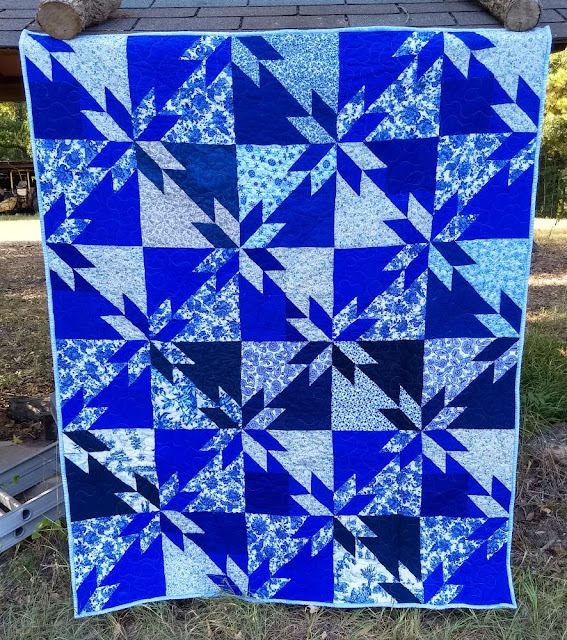 The new block drive just opened up and it's a repeat of an old favorite of mine, another one that's great for masculine quilts. Be sure to check it out. This top has blocks with a teal or aqua color base. Thanks to everyone who participated in the March/April block drive! 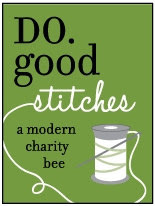 The number of quilters and states participating increases with every drive! Sorry about the color! I forgot to change setting on the scanner. 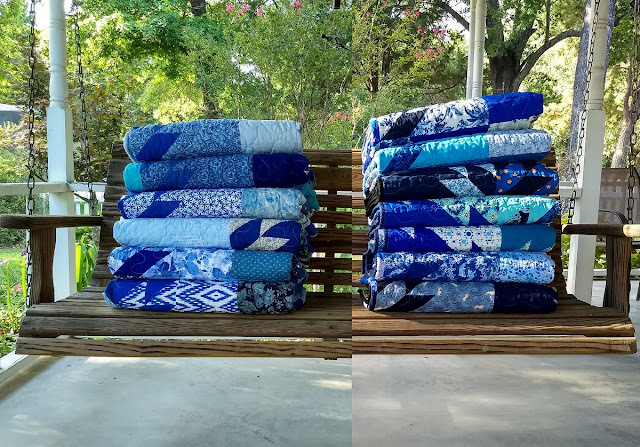 Covered in Love is a 501(c)(3) charity that donates quilts to patients dying in the hospital, over 300 so far! 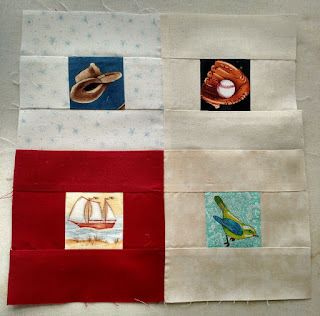 The Sept/Oct drive is a repeat of one of my old favorites, the grown-up eye-spy quilt. Check out the main post HERE if you want to get involved. 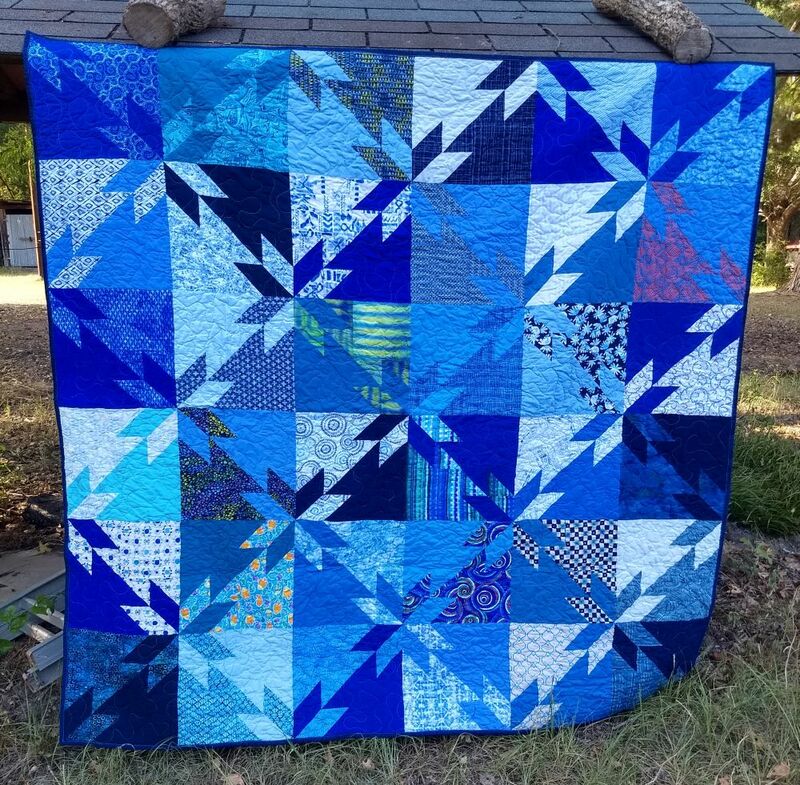 Oh, those quilts just seem to glow beautifully! I love the Hunter's Star pattern & think it is one of my very favorites. 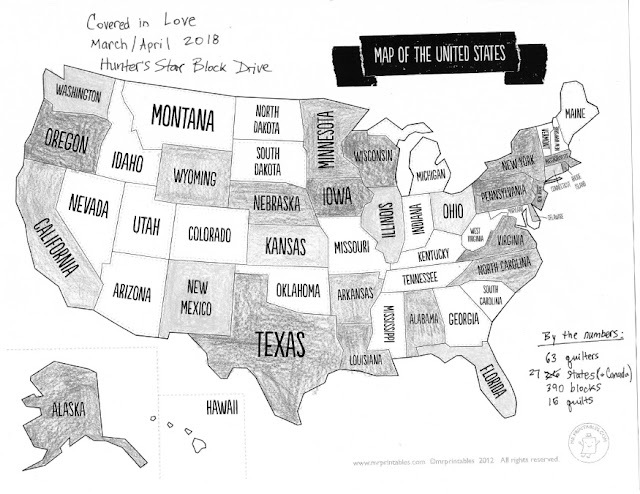 Thanks for posting the map of the states & where the quilts are coming from. I'm looking forward to the day ALL the states will be represented for your cause! I am always so amazed! I applaud you and everyone who pitches in to help in a big way. They make the few blocks I manage to send in seem so insignificant. More gorgeous quilts. I will be sending some grown-up eye-spy blocks soon. 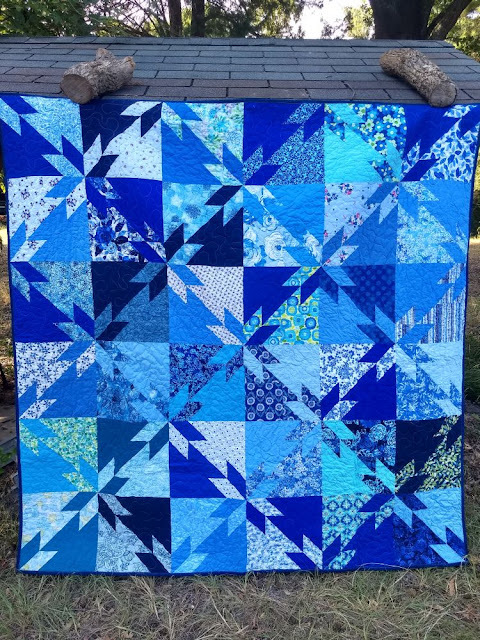 Beautiful blue quilts! Those will be much appreciated by someone in need. Thanks for linking to Finished or Not Friday!